Made in Finland, UphillSport Extra Fit Low Trainer Socks are designed to work with your sports shoe, helping to improve your performance whatever your game, with fabric that stretches both ways across the foot for a close, comfortable fit, which extends to your shoes as well. 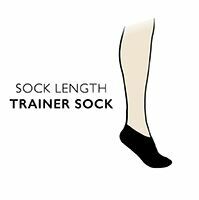 A Y-shaped, fitted heel and fine gauge weave, with ribbed padding limited to the ball, upper and heel of the foot improves fit and allows the closest possible contact with your trainers to give you total control. Despite the low, shaft-less ankle, the Achilles tendon is protected by a tab, and hand linked toes for smooth seams help to avoid blusters and abrasion. The fabric blend is quick-drying, helping to keep feet sweat-free and healthy.